If you haven’t noticed yet, I’m big on cooking at home. Now only does it save money, it’s also always a healthier option. When you cook, it’s less oil, less butter, and less fat since you’re in control on the ingredients. I almost always have a side of veggies with every dinner meal. Because I grew up in a Chinese household, there’s always been a variety of foods on the table to be eaten family style. Usually our house had one meat dish and two different plates of vegetables, and of course rice, for a family of four. So I love variety when it comes to dinner. When I cook for two, I always have one meat dish and one veggie dish (we try to go without rice too). This week I’ll share with you a meal that I cook for MG and myself (chicken and veggies). 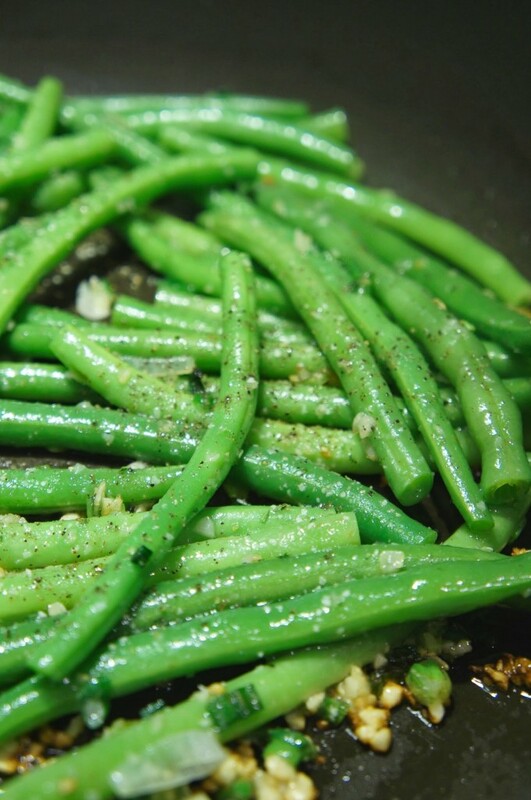 We’ll start out with the veggie dish first – green beans! Green beans are my favorite vegetable. I love the crunch of the bean and the squeak between your teeth when eating. 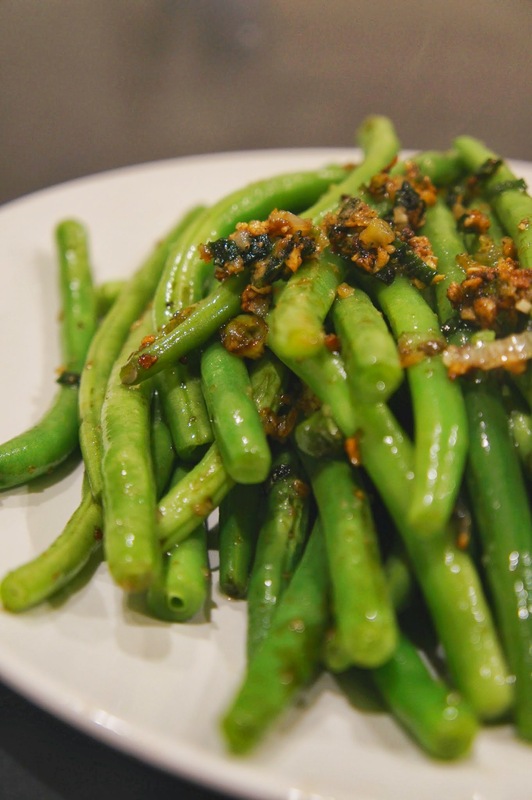 I basically always make this recipe when I have green beans – it’s my go-to! 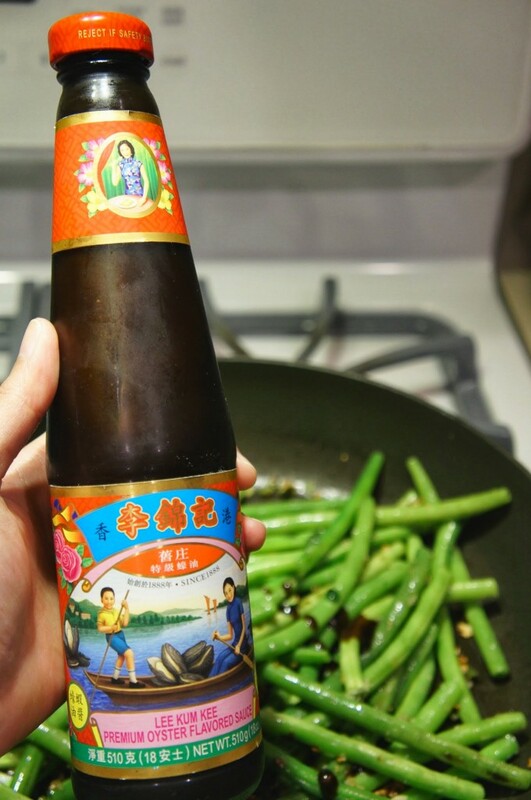 It’s Asian because of the soy sauce and oyster sauce, and the sauces make the beans extremely tasty. Another big plus, it’s a 3 step dish! 1. This is my tip: steam or boil the green beans first so they cook faster! I like to boil because it only takes 5-7 minutes. Then drain and set aside. 2. 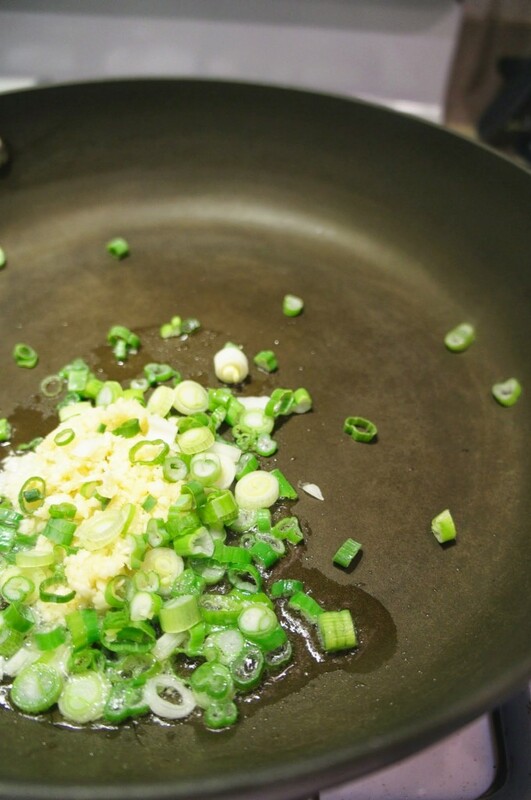 Add a teaspoon of olive oil to a pan on medium-high heat, and cook the garlic and scallions until crisp and golden, but not burnt. Now add the drained green beans to the pan – I love the sizzle in this process! 3. Sprinkle salt and pepper, add a teaspoon of soy sauce, a teaspoon of sesame oil, and a tablespoon of oyster sauce. Mix it into the beans until beans are thoroughly coated. Serve right away! Get this at any Asian market – it’s also delicious just eating it with rice! 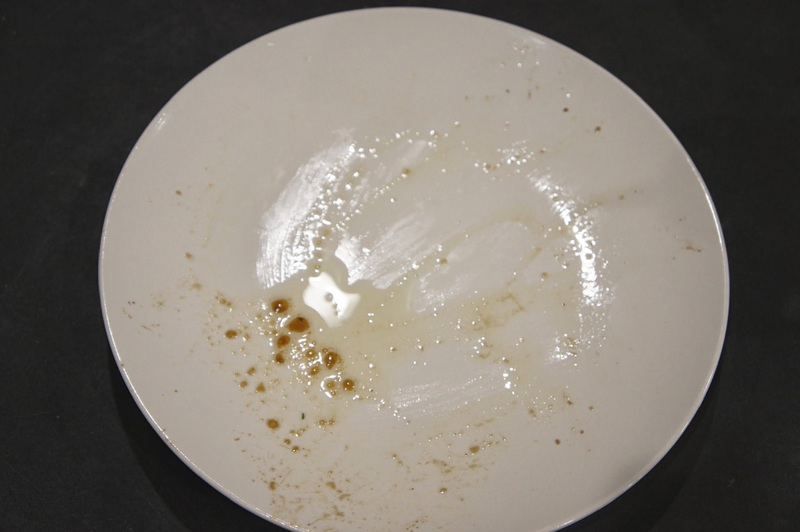 Yeah, we basically licked up all the sauce! What’s your favorite vegetable? Do you have any veggie recipes to share? I’m always on the lookout for new vegetable recipes! Stay tuned on Friday for my chicken recipe to pair with the green beans! 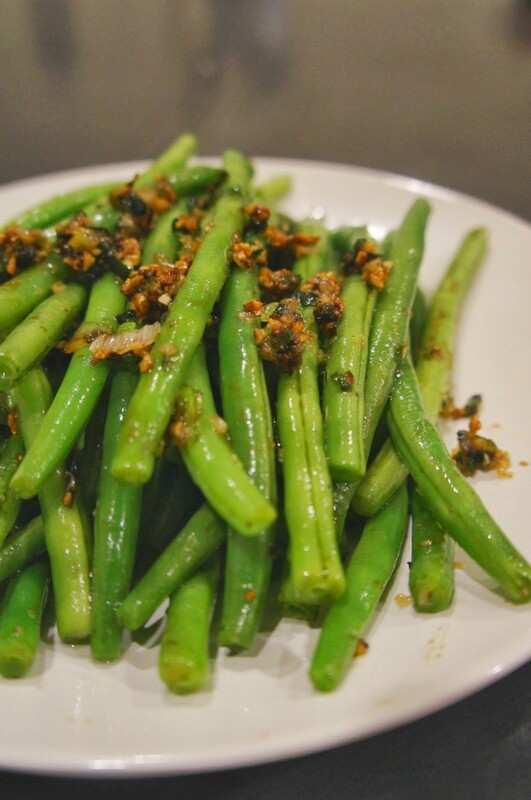 This entry was posted in Food & Recipes and tagged asian, food, garlic, green beans, homemade, oyster sauce, recipe, scallions, soy sauce, vegetables, veggies. Bookmark the permalink. Yum! Love the crunchy topping.